Uploading a file is the best way to get your file to us if you have broadband internet access. 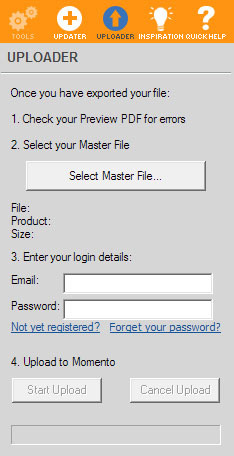 You can upload a file from within the Momento software or by signing in and uploading via the Momento website. Note: If you have a problem, repeat and choose the Alternative Uploader button instead. If you are still having problems please call our customer service team and they will help you out. For those without broadband internet you can send us your MBF file by burning it to a CD or DVD and mailing it to the address on our contacts page. When we receive your mail, we will upload the file for you and send an email confirming that it is ready to order. Note: Please label your disc clearly with your name, email address and phone number. Tip: Double check that you have copied the MBF file to the disc NOT your MBK or PDF Preview. Visit the Help Centre page on the Momento website for details on how to order your product once you have uploaded your files.